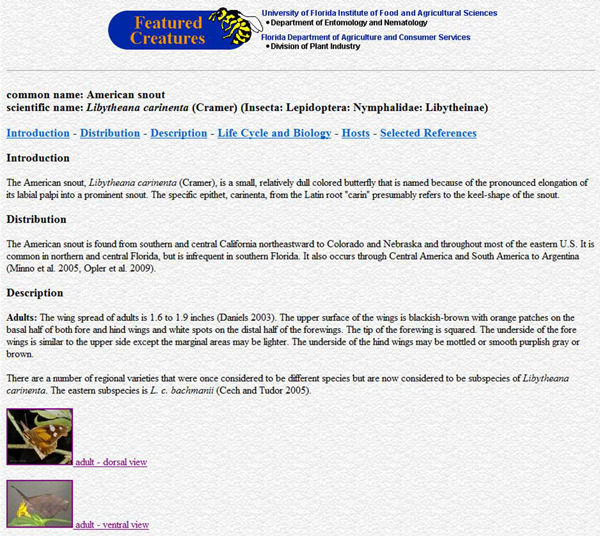 Featured Creatures was founded in 1996 by Thomas Fasulo. When he retired in June 2012, Dr. Jennifer Gillett-Kaufman took over website management and gave the site a facelift in early 2013. Special thanks go to Don Wasik and Jane Medley for designing the new web template and to Morgan A. Byron for updating some of the pages and transitioning thousands of photos into a web friendly format. 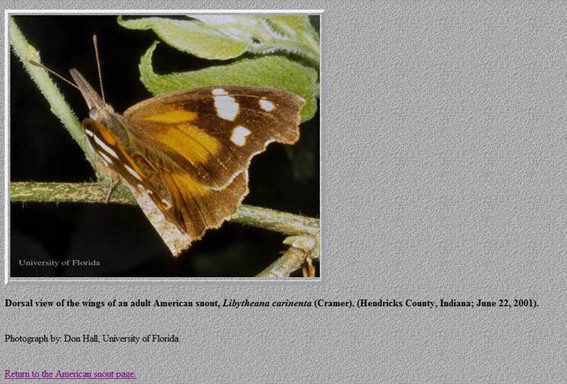 Below are two screenshots of an article on the American snout butterfly in the original format. You can see the same article here in the new format. Figure 1. Screenshot of an original article. The original layout for articles had a light grey background, an undefined page width and thumbnail photos that linked to separate photo pages. This layout was designed before computer users had access to multiple screens or widescreen monitors. The new layout has a white background to make the page easy to read, especially for colorblind users. The new layout was designed to be accessible with mobile devices, easy to print, and easy to read on desktop monitors. Figure 2. This is a screenshot of an original photo page (photo pages had a dark grey background). Small thumbnails (seen in Figure 1) in the article would take you to a separate webpage to view photos. This layout allowed people with slow Internet connections to view articles fast. The new layout shows all photos on the same page as the article, and photos are saved in a format that optimizes their download speed based on the type of device being used. Now users can easily print articles with photos. In addition, photos have been captioned with text so visually impaired users with audible assistance devices can enjoy the articles.